Baron Von Raschke gets inducted in the St Louis Hall of Fame Saturday, the city where he introduced his fearsome claw. Throughout the history of Pro Wrestling there has been Superstars that excelled in amateur sports including wrestling. 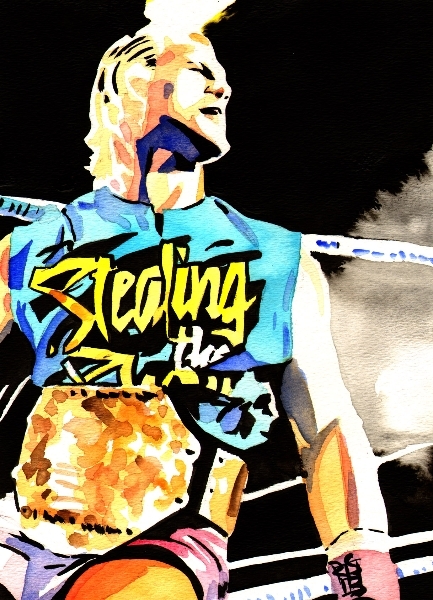 Wrestling fans have embraced them and quickly take notice of their talents. Today’s stars Kurt Angle, Bobby Lashley , Jack Swagger, Scott Steiner and Brock Lesnar have all been a part of these elite wrestlers that have shown that they are complete athletes by having their hand raised outside of the squared circle. This Saturday Midwest wrestling fans will get to meet a guy that is in the same league as the gentlemen I just mentioned. Baron Von Raschke is one of the most memorable wrestlers of all time. “The Master of the Claw” Raschke has sent fear in fans and wrestlers alike in his storied career before being loved by all. Jim Raschke would fine success early in life when his High School football team in Omaha North, in Omaha Nebraska won the 1957 Football state Championship with Jim in the starting lineup. A year later he would become the Nebraska High School Heavyweight Wrestling Champion. In 1959 Jim would enroll at the University of Nebraska at Lincoln where he was under the coaching of Olympic Champion Bill Smith, Mickey Sporano and Bobby Mancuso. In his last year at the UN Jim wins the Big 8 conference championship as a Heavyweight while completing a B.S. in Biology. Out of collage Jim won a spot wins a spot on the U.S. team which competes at the World Games in Halsingborg, Sweden. He becomes the second American to win a medal in Greco-Roman wrestling by capturing the Bronze medal. After being drafted, Jim joined the Army wrestling team. In 1964 he wins AAU National Championships in Freestyle and Greco-Roman wrestling. He wins gold medals in 1964 and 1965 in the Army wrestling championships and in the Interservice championships. 1964 is an Olympic year and Jim earned a spot on the U.S. team by winning the Greco-Roman wrestling try-outs. Unfortunately, a hyper-extended elbow took Jim out of competition just days before the team leaves for Tokyo. In 1966 Jim would get the chance to train with Promoter and Wrestler Verne Gagne in Minneapolis, Minnesota. Gagne, one of the most complete wrestlers of his day had won two NCAA titles at the University of Minnesota was able to give Jim valuable advice on the difference between amateur wrestling and professional wrestling. 1967 will go down in history as the year that Mad Dog Vachon would transform Jim into BARON VON RASCHKE hailing from Germany. Raschke would terrorize fan favorites around the world for years to come. Throughout the 70’s the Baron would travel to Japan including a main event in Tokyo against Giant Baba. He would also challenge former mentor Verne Gagne for the AWA Championship and make a tour of Vince McMahon Sr. WWWF. While in the WWWF his claw hold was “censored” by a huge RED “X” on WWWF TV because of the blood it would draw when applied. One of the most impressive notes on his resume was that he is one of the few men ever to defeat Bruno Sammartino. Later on he would hold onto many single titles including being recognized as the first ever NWA TV Champion. Raschke was in successful tag teams with Mad Dog Vachon, Paul Jones, Greg Valentine, Hans Schmidt. On May 1984 Raschke and the Crusher would win the AWA Tag team titles by defeating Jerry Blackwell & Ken Patera. They would go on to lose them belts to the young powerful tag team the Road Warriors in August. You can purchase the Acclaim Entertainment, Inc. released video game Legends of Wrestling II featuring 65 pro wrestling greats ithat included Baron von Raschke. I have been fortunate to get to meet the Baron at the International Wrestling Institute and Museum in Newton, Iowa in the past and though he did not know me, he was one of the nicest guys I have met in the sport. I can only reply to that statement with Baron’s most famous quote. 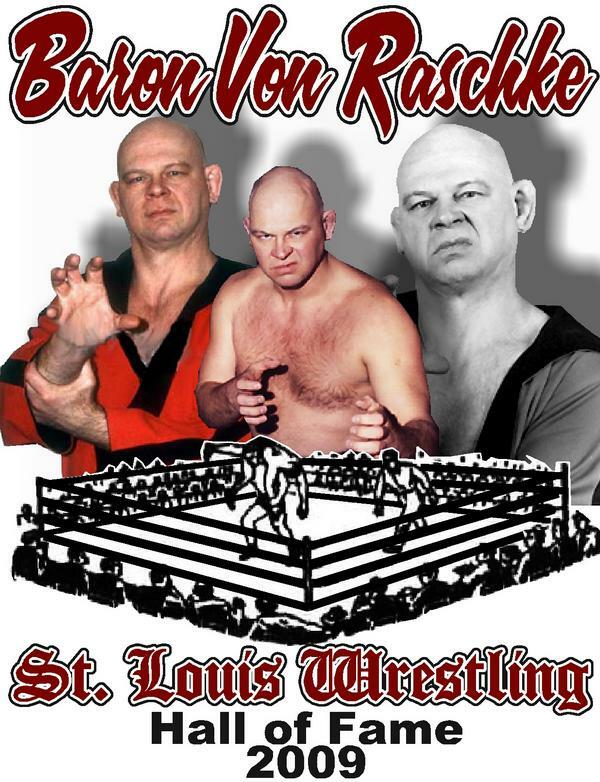 To meet the Baron live and in person do not miss this Saturday when MMWA-SICW returns Saturday to East Carondelet Community Center to honor Baron Von Raschke in the 2009 St Louis Wrestling Hall of Fame. The Baron will be signing autographs and meeting fans at a wrestling event. Tune in to KZQZ (1430 AM) on your radio dial at 3:00 PM on December 12th to hear the Baron interviewed. To check out the ST Louis Wrestling Hall of Fame go here. The Baron Von Raschke official Website. I found this great commercial on youtube. Note this is old please do not send money to this address. This entry was posted on December 9, 2009 at 1:39 am	and is filed under Uncategorized. Tagged: Baron Von Raschke. You can follow any responses to this entry through the RSS 2.0 feed. You can leave a response, or trackback from your own site. Great Article baby! I remember meeting him too, a very nice guy.